The great maritime expeditions of the first half of the nineteenth century, still influenced by the philosophy of the Age of Enlightenment, was also interested in natural sciences and ethnography. 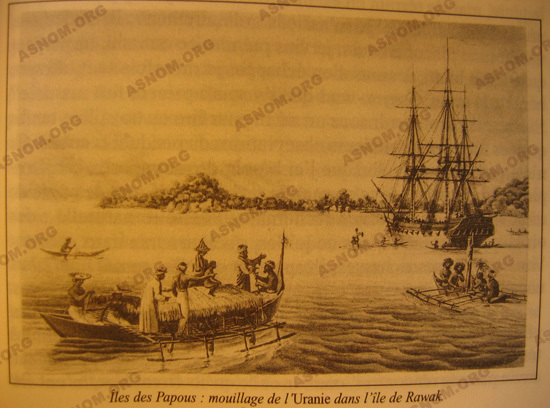 At the end of the eighteenth century, certain expeditions had been very fruitful : the voyage of the Lapérousse, the Egyptian expedition, but, after 1815, the navy stops taking aboard civilian scientists during great voyages of discovery. The experiences of the previous century, in particular those of the Bougainville and Entrecasteaux voyages, had not always been agreeable.The independent character of one group and the lack of adaptability of the other had been the source of incidents that the navy had no intention of observing again. It is therefore decided, at the time of the Restoration, to appoint naturalists from among the naval officers, physicians and pharmacists, more accustomed to long navigations and cohabitation in cramped premises but also in military environments. Chosen by the Inspector General of the Health Service, in function of their taste for and their competence in natural sciences, these naturalists came to Paris before their departure in order to obtain instructions from the professors of the Museum and members of the Academy of Sciences, as well as from the Society of Medicine. 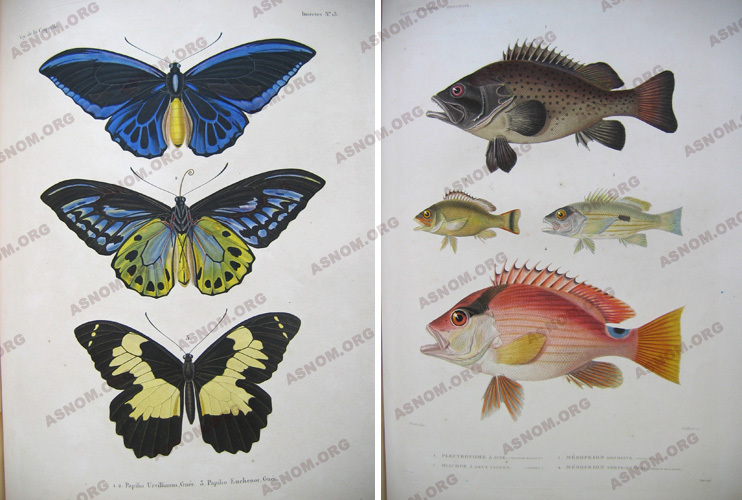 The Naval Ministry, in its turn, had published in 1824 precise instructions on the manner of making collections of natural history objects and of preserving them on board before sending them to the Museum. In fact, it was necessary not only to know how to observe but also choose with discernment three types of examples – zoological, botanical and mineralogical – collect them, identify them, class them, label them, inscribe the corresponding notices, preserve them and see to it that they arrive in good state at the Museum. Besides, the naturalists made a large number of sketches or drawings. It was thus that Lesson drew 70 fishs in their natural colours but also molluscs and zoophytes, painted to resemble the living animals; and Quoy brought back, from his voyage on Astrolabe, 6 000 drawings and as many reproductions. When they returned, reports on the collections were made by commissions and presented to the Academy of Sciences by members as eminent as Arago, Cuvier, Cordier, Blainville, Mirbel or Beaumont. Some of them deserve to be mentioned in particular. - Charles Gaudichaud-Beaupre (1789-1854), pharmacist and botanist, who will later sail on the corvette Bonite. From all his voyages, he brought back more than 10 000 plants, of which between 1 200 and 1 400 were new species. He turned out to be one of the great scientific discoverers of the century and proved himself an eminent specialist in botanical systematics. - Jean-René-Constant Quoy (1790-1869), sailing later in 1826 on the corvette Astrolabe for a second voyage of circumnavigation, will be, in November 1848, the Inspector General of the Naval Health Service, which he will modernize. This great scholar contributed greatly towards the increase of knowledge in natural sciences. - Joseph-Paul Gaimard (1793-1858) was one of the most active naturalist voyagers in the first half of the nineteenth century. After two voyages of circumnavigation with Quoy, on the Uranie and on the Astrolabe, he was appointed in 1835 President of the Scientific Commission of Expeditions to Polar Seas and, in this capacity, he made four campaigns in the North Atlantic on the corvette Recherche, between 1835 and 1839. On the corvette Coquille (1822-1825), under the command of L-I. 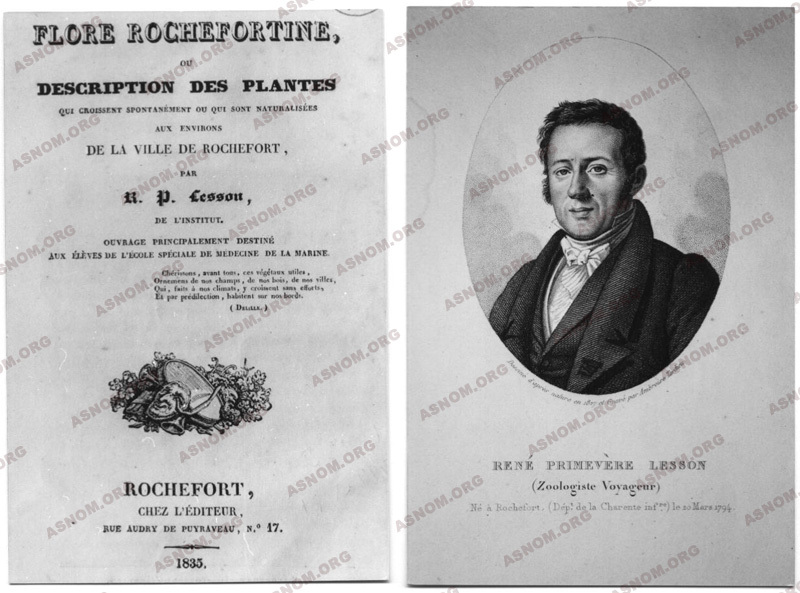 Duperrey, are taken on board: the naturalistic pharmacist René-Primevère Lesson (1794-1849), author of a considerable work consisting of 44 volumes as well as a great number of articles and memoirs. He has above all left valuable work on zoology, especially on ornithology, without however neglecting the study of mammals, but he also published works on his travels, on medicine, anthropology, prehistory and the archaeology of the Lower Charente. A well-known and appreciated man of learning, he plays a determining role in the development of natural sciences and encourages the rapid development of systematics. The surgeon Prosper Garnot (1794-1838) is also taken on board; he establishes, in Martinique, a course of Anatomy and Surgery in 1829. On the corvette Astrolabe (1826-1829), under the command of J.-S.-C. Dumont d'Urville, one finds again the surgeons Gaimard and Quoy, accompanied by the other surgeon, Pierre-Adolphe Lesson (1805-1888), the brother of René-Primevère. Pierre-Adolph, appointed in June 1844 as Chief of the Health Service in Tahiti, participated actively in the production of many works and wrote many articles in diverse reviews. He was a member of the Society of Anthropology. On the corvette Bonite (1836-1837), under the command of A.-N. Vaillant, there are, besides the pharmacist Gaudichaud on his second voyage of circumnavigation, the surgeons Fortuné Eydoux (1802-1841) and Louis Souleyet (1811-1852). In the collective work giving an account of the campaign, Eydoux and Souleyet wrote the three volumes on Zoology, Gaudichaud the four volumes on Botany. On the corvettes Astrolabe and Zélée, during J.-S.-C. Dumont d'Urville's expedition to the South Pole (1837-1840), the naturalists were Jacques-Bernard Hombron (1798-1862) and Louis Le Breton (1818-1866) for the Astrolabe, Elie-Jean-François Le Guillou (1806-) and Honoré Jacquinot (1814-1853) for the Zélée. The harvest they realized was the greatest ever brought back from a single expedition. In particular, Le Guillou gathered an exceptional mineralogical collection, 3 000 examples of rocks, sometimes connected to fossils, which made it possible to clarify the nature and dating of South Pole territories. In his turn, Jacquinot assisted Hombron in giving an account of the zoological aspect of the voyage, which appeared in 1846. Many of these naturalists were honoured by the principal institutions. Thus the Academy of Sciences admitted as associative members Gaudichaud (1827), Quoy (1830) and R.-P. Lesson(1833). Gaudichard will be a titular member in 1837. The Academy of Medicine admits within it as associative members Gaudichaud-Beaupré, Quoy, Gaimard and R.-P. Lesson (all four of them in 1825). The same distinction will be accorded to Garnot in 1834. This is how the World of Science showed its gratitude towards these learned men for all that they had contributed to Science in the course of their expeditions during this century of discoveries.